A screen capture from the Salish and Qlispe (Séliš & Ql̓ispé) Language Learning App. The Salish and Pend d’Orielle Tribes on the Flathead Reservation are trying something new to save their language — an app. The Tribes’ Culture Committee released the app last month. GeorGye Coffey, a freshman at St. Ignatius High School, has become a regular user. She clicks on the bright green “Language” button and chooses a quiz from a menu 45 lessons. The app uses games and quizzes to teach 750 Salish words and phrases — enough to carry a basic conversation. 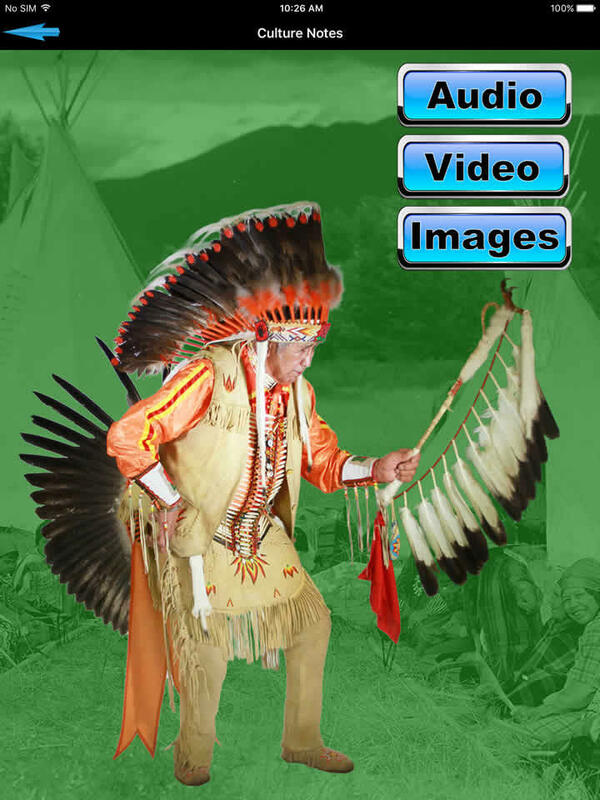 The app also has a dictionary and sections of historical photos, videos and stories told in Salish. Coffey grew up speaking Salish with her grandparents before attending Nkwusm, a Salish-immersion school in Arlee. She transferred to St. Ignatius public schools in sixth grade, and says her first few days of class speaking English were a bit of culture shock. "When I asked the teacher something I’d like ask in Salish and then I'd have to correct myself and ask them again in English. That was really hard," Coffey said. The Salish and Qlispe Language Learning app uses games and quizzes to teach 750 Salish words and phrases — enough to carry a basic conversation. Coffey is pretty unusual — there are only two dozen fluent Salish speakers, and most of them are in their 70s. She’s one of the best Salish speakers at her school — she even outspeaks her teacher at times — but she’s still not considered fluent. She no longer lives with her Salish-speaking grandfather and most of her classmates don’t understand her. "I have lost a lot of it," Coffey said, "but I've been using the app, and I've been getting bits back." That’s exactly what Chaney Bell, the Salish language coordinator for the culture committee, hopes for. "We don’t want to rely on tools for saving our language," Bell says. "To save a language you have to talk with people." Bell worked with Thornton Media, a company that specializes in developing Native-language apps, to create the Salish and Qlispe (Séliš & Ql̓ispé) Language Learning App. Lessons in the app follow a language curriculum that’s used in a few schools on the Reservation. Bell says nothing can take the place of regular practice with fluent speakers, but the app is a good tool for young language learners who don’t hang out with elders frequently. "We always say tools and books and CDs, they’re just, they’re not gonna save our language, but they’re tools to support a learner." Bell hopes the app will switch the responsibility of language preservation from the few elders who still speak Salish to the younger generation. A screen capture from the Salish and Qlispe (Séliš & Ql̓ispé) Language Learning App.A screen capture from the Salish and Qlispe (Séliš & Ql̓ispé) Language Learning App. "This is it, our last chance to keep our language alive," Bell says. "All the languages in the world, and this one’s ours, for our people. We want to pass that on to our kids. What we say is, this is our language and it adds to the beauty of the world by keeping it alive. But getting that message to our people is tough sometimes." Tony Incashola, who’s in his 70s, is director of the Salish Pend d’Orielle Culture Committee. He says language is part of identity, and losing the ability to speak Salish — his native language — means losing sense of who he is. "I always tell young people that in order for us to survive as a people we have to keep that foundation of our language there because that’s who we are." Incashola says losing Salish means also losing stories that tell the history of the reservation. "Through the language, everything explains itself … We would lose not only our identity, but also our connection to the world itself" Incashola says. "That’s why it’s important, that our children learn and understand that through language, they always know who they are, where they come from, and which direction they are going." Thornton Media, the company that created the Salish Language App, also worked with the Crow tribe to develop a language learning app. Blackfeet Community College and Stone Child College of the Chippewa-Cree Tribe will follow suit next year. Federal and tribal wildlife agencies are offering a $4,000 reward for information about the illegal shooting of a female grizzly bear north of St. Ignatius. The bear was discovered mortally wounded by a shotgun blast two weeks ago by Confederated Salish and Kootenai Tribes biologists. Death and taxes are supposedly two certainties in life. But at the moment, in Lake County, property taxes aren’t so certain. The county is suing the state Department of Revenue over one property -- the Seli’š Ksanka Qlispe’ (say-LISH kuh-ZAHN-kuh kud-LEE-speh) Dam, formerly known as the Kerr Dam, which the Confederated Salish and Kootenai Tribes bought from NorthWestern Energy last year. The sale was negotiated in 1985 by the Federal Energy Regulatory Commission. The Confederated Salish and Kootenai Tribes Friday said they’ve modified their proposal to take over management of the National Bison Range. The tribes released draft federal legislation in June that would transfer management of the range to them from the agency that’s in control now, the U.S. Fish and Wildlife Service. The Confederated Salish and Kootenai Tribes’ new veterans healthcare representative says she brings a unique perspective to the job. A visit to the Flathead Indian Reservation in Montana, where students immerse themselves in Salish language and culture at the ground-breaking Nkwusm School.